After my partner Rebecca had decided to live together, we decided that, both being dog lovers, we’d love to rescue a dog. 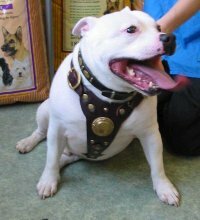 Having considered various breeds, a Staffordshire Bull Terrier somehow became the final choice. 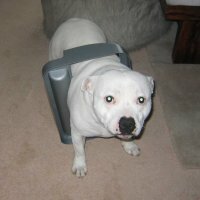 After scouring various internet sites, I stumbled across the SBT Rescue site and called to enquire. No sooner had I done this, than I had a home visit from a chap who said all was OK and I could look at a dog at the weekend. This was in March of 2005. 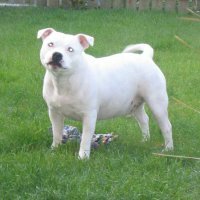 I received an email from Bob the following day to say that they had just the chap for me, a big boy called Boyce, who was languishing in a kennel in Carlisle. Well, how could I refuse that?! Off we went the following Sunday to Carlisle and got there to be greeted by the fattest, most excited dog I’d ever seen – Boyce! After taking him for a walk, Rebecca and I decided that we’d love to have him and set off on the journey back to Leeds. Boyce soon settled in and after a few weeks, out came his real personality – and what a personality it is!! He loves his tummy being rubbed and likes nothing more than to curl up on the sofa with Rebecca and I.
Boyce – or Boycie as he’s known, has since lost a load of weight and become very fit. He tires me out regularly when we are playing football on the park, although he still has a bit of a beer belly! He’s recently made friends with a 4 year old Boxer called Buddy and they can’t get enough of each other. All in all, the past 14 months with Boycie have been fantastic and he’s a permanent fixture in our house. There are more photos of him in our and our parents’ houses than there are of us! We’ve loved each and every minute of our time with him and as we’re moving to a bigger house with a huge park just 50 yards away, who knows whether he’ll be getting a permanent playmate in the near future?! ?